This workshop in offered in partnership with the Desert Institute. BY POPULAR REQUEST, WE ADDED A SECOND WEEK! SEE DATES BELOW. 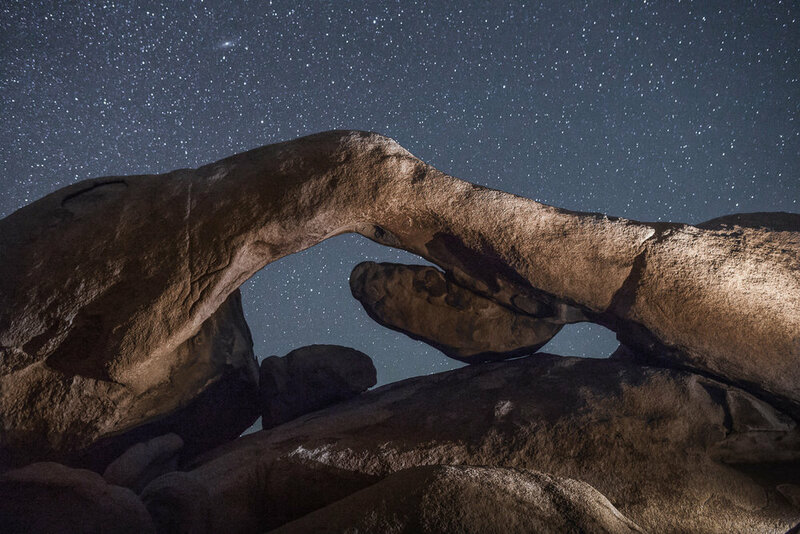 Joshua Tree National Park encompasses sections of two different deserts—the Mojave and the Colorado—both full of opportunities for remarkable images. This workshop was held April 21-26, 2017. This was a 6-day and 5-night workshop. The adventure began at 10 a.m. on April 21 and ended about 4 p.m. on April 26. Though this is a double opportunity, as with all National Parks at Night photo workshops, we will teach at this location only once. If you have a dream of making epic long exposures at night in this park, we hope you will join us. 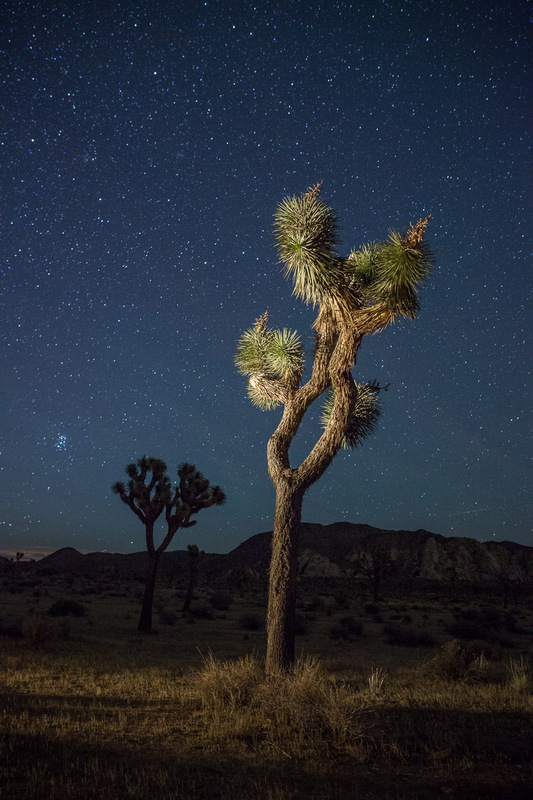 This six-day, five-night photography workshop in Joshua Tree National Park will take place between the waxing crescent and waxing gibbous phases of the moon, which means we’ll have an increasing amount of moonlight during the workshop, and dark skies very late after the moon sets. This is ideal for light painting, which will be a major component of this workshop. The temperature will be moderated by the season, with daytime temperatures in the upper 80s, and nighttime lows in the low 50s. 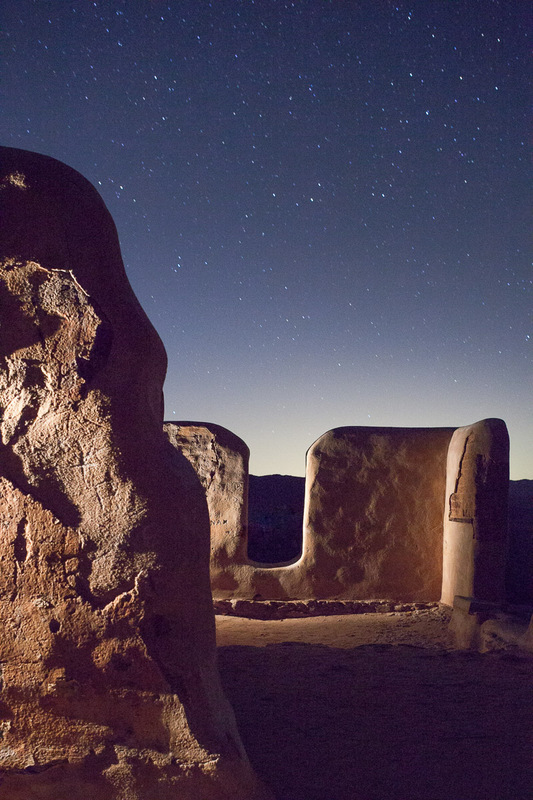 Locations may include Keys Ranch ruins, Arch Rock, the Cholla Cactus Garden, Ryan Ranch ruins, and of course Joshua trees! We may also venture outside the park one night to photograph some of the many interesting sites in the area. Discoveries await. The workshop base camp will be in Twentynine Palms, California. Palm Springs is the closest airport, but you might also consider one of the Los Angeles area airports if you need more flight options. We have secured a block of rooms for a discounted rate at the Holiday Inn Express: Twentynine Palms-Joshua Tree National Park. Once you make your deposit, you will receive a code that can be used to reserve one of the group rooms. The group reservation is for six nights, from April 20 to check-out on April 26. There are other lodging options in Twentynine Palms, and camping in the park if you prefer, but there are no showers in any of the park’s campgrounds. As with most NPAN workshops, we will generally be operating on a two-meal schedule—late breakfast and then an early supper before going out to shoot. Many people bring sandwiches or other snacks to eat on location at night. 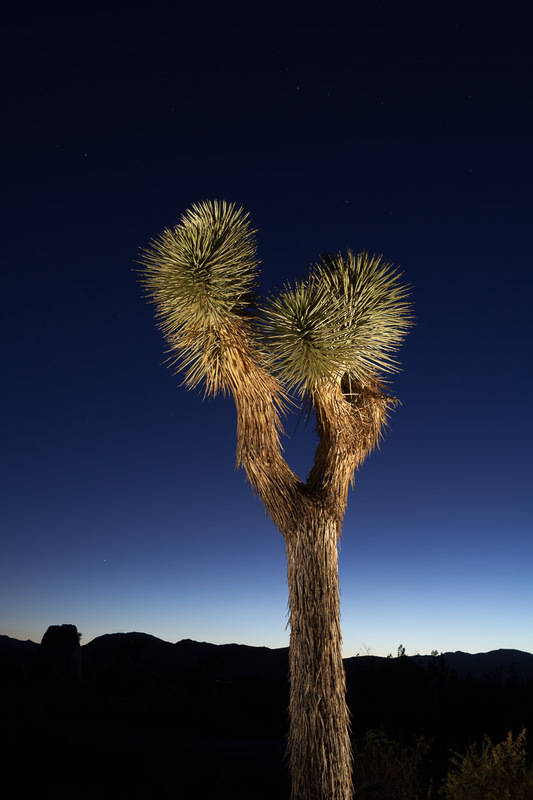 Joshua Tree is a park that really needs a good bit of time to get to know. Like a lot of desert environments, it seems there’s not much there at first glance. That’s hardly the case. Enormous in size, the park encompasses two deserts—the lower, hotter and drier Colorado Desert in the eastern half of the park; and the higher, wetter and slightly cooler Mojave Desert that makes up the western half of the park, which is home to the famous, wily trees. The eastern half of the desert’s vegetation is dominated by creosote bush, cholla and ocotillo cacti, and the varied and often dramatic geology is a large part of the park’s appeal across all areas. I made my first visit to Joshua Tree in 1992, and camped at Jumbo Rocks—the largest and probably best known of the campgrounds. I made one memorable night photograph there on that trip, an image of a Mini Cooper-size boulder wedged tightly into a narrow crevice somewhere in the labyrinthine maze of rocks that gives the campground its name. The image was obviously shot on film (120 color negative film) made with a Pentax 67 camera. It was a full moon image—a 30 minute exposure with light painting on the boulder and a low camera angle to exaggerate the size and to show lots of star trails. 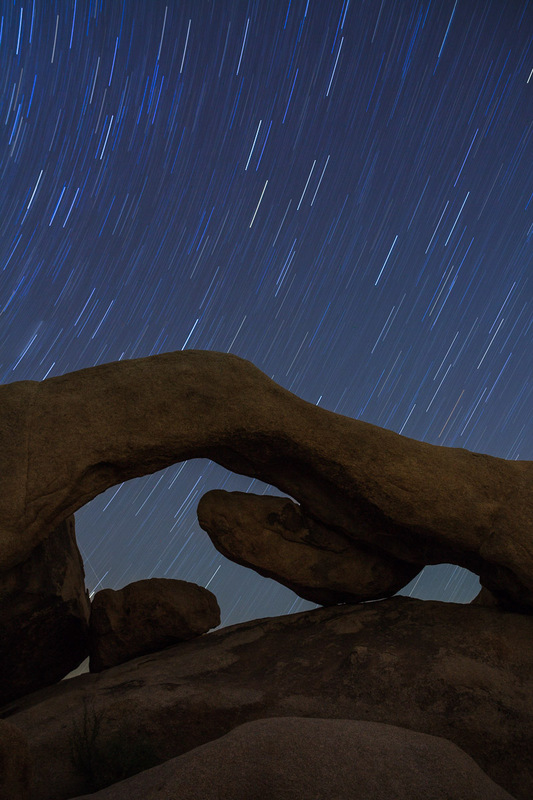 Unfortunately, I bumped the tripod while squeezing between the camera and rock face to do my light painting, and the star trails gave it away. The trails were all broken when the camera was displaced by just a tiny bit, and as a result, I never printed the image. Still, I always remembered the photograph, and every time I’ve returned to Joshua Tree since then, I’ve wanted to re-shoot the image, and to do it right. But I’ve never managed to find that spot again. I’ll keep looking, and one day I’ll find it. The Pentax 67 is long gone, but I’m sure that rock is still there! Fortunately for us, there are so many things and places to photograph in Joshua Tree National Park that I’ll never run out of images to make. I look forward to sharing my experiences of one of my favorite national parks with you in 2017!